Places and songs hold special memories for many people. In my little world one of those places is Polesden Lacey; my mum enjoyed visiting the house and gardens and in more recent years it has become a regular favourite for morning dog walks. The house stands in a large estate and a walk around the nearer lanes is just about right for the Newfies. 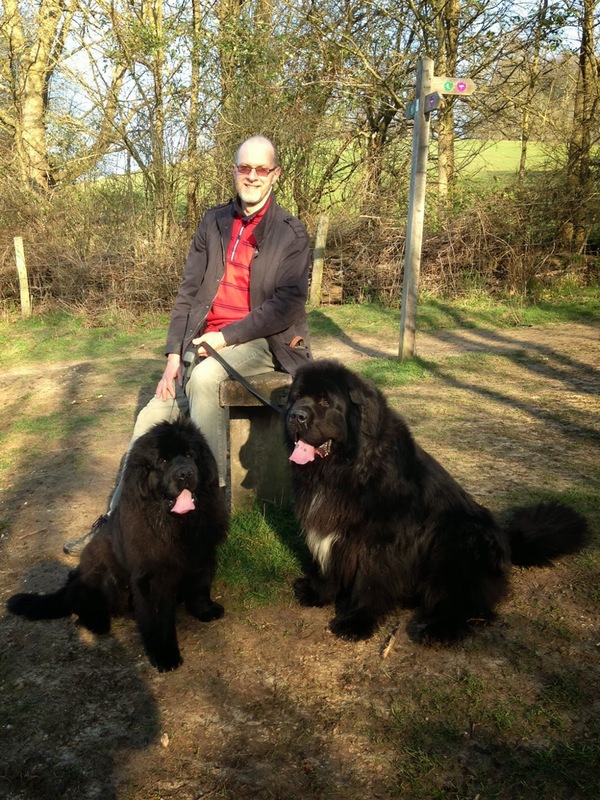 Last summer I took Angus and young Buster there in Springtime and shared happy pictures on my blog of us together in favorite resting places on our walk. Tragically it turned out to be our last visit together and Buster died barely a month later. I had only been back once or twice after, without the dogs, and remember sitting looking across the view from the verandah of the house with tears pouring down my face as I remembered Buster and how happy we had been such a short while before. So what about the melodies. Well that is a Buster memory again. When he was poorly at home I put on a cd of old standard songs. The first one was Dean Martin singing "Memories are Made of This." Buster was asleep but he sat up and cocked his ears when the music started and for that simple silly reason as well as the obvious meaning of the song, I associate it with him. Whenever I hear it I see him sitting up with his head on one side watching the loudspeaker in my sitting room, sniffing at it as if to work out where the sound was coming from. So how does this all come together. Well, last Sunday I made my first return to Polesden for a walk with the dogs, this time with Angus and young Mr Bond. As I approached the gate memories stirred of course but then, and quite by chance, the cd in the car reached its end and the next one in the changer loaded itself, a home made one of some old favourites, and at the very moment I drove through the gate Dean Martin's voice began singing "Memories are Made of This." Probably a complete lucky coincidence but a moment to remember. The spring morning was lovely and we had a great walk and made new memories in our favourite resting places. Ian was looking after Angus while I steered the extremely energetic Mr Bond around the sheep, swampy puddles and other countryside features. Here we are now, a happy family again enjoying the Spring sunshine.